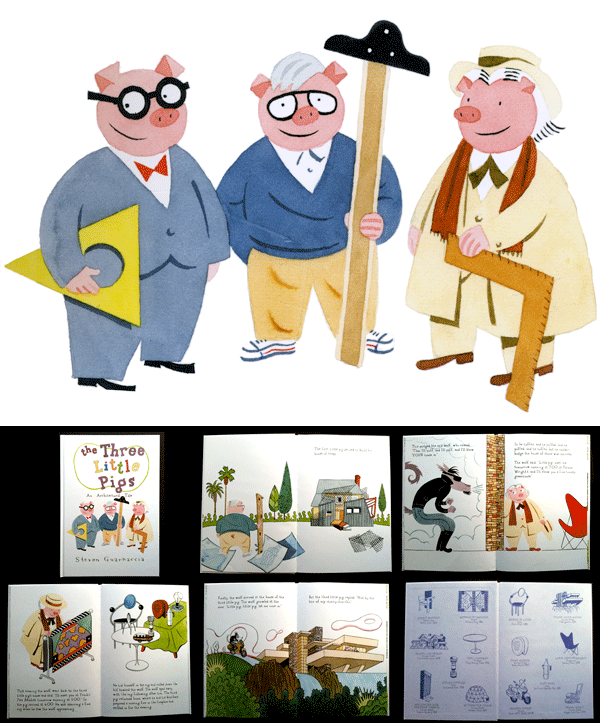 The book is a retelling of the original story except the pigs are famous architects Frank Lloyd Wright, Philip Johnson and Frank Gehry. It’s chock-full of design references and iconic work by the pigs and others like Noguchi, Saarinen, Starck, Sottsass, and many more. Steven nails the idiosyncrasies of the 3 architects from their glasses, shoes and hats to their signature homes. He gives away his bias for Wright’s home, Fallingwater, or maybe it’s the only one that is built to withstand the blow of the wolf in leather? This is a great intro to design for children and a testament to the love of the subject from one legendary designer (illustrator) himself.